Queen Esther (1878) as imagined bi Edwin Long. 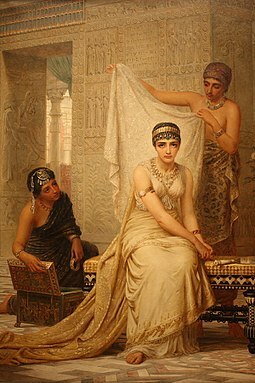 Esther (/ˈɛstər/; Ebreu: אֶסְתֵּר‬, Modren Ester, Tiberian ʼEstēr), born Hadassah, is the eponymous heroine o the Biblical Beuk o Esther. This page wis last eeditit on 28 Mairch 2017, at 05:00.